I am consistently amazed at how much great pizza exists in Connecticut. Tim and I have been going on "pizza quests" for some time now, trying new places all over the state. Ketteract has inspired me with his Connecticut Grinder thread to start a similar thread for Connecticut pizza. I'll have to back track to a few of our favorites to be sure I post them here, but will start with our last weekend "quest" - Grimaldi's of New York fame. They opened a place in Woodbridge, northwest of New Haven - with, as most of you know, some very serious pizza competition! It sits in a strip mall right off of the Wilbur Cross Parkway (Rt 15), next to Katz's Deli (NOT of NY fame, but still fairly good). The coal oven is facing you as soon as you walk in the door. We went on a Saturday late afternoon, and didn't wait at all. They seem to do a brisk take out business, and all the tables were full when we were ready to depart. The menu provides some history of the pizza fame. I had the chopped salad to start, which was uninspired. It tasted basically of vinegar - no spice, no salt, and the fresh mozzerella had no flavor at all. We fared better on the pizza - we ordered two medium pizzas - one with soprasseta and extra cheese, the second with pepperoni, onions, and half mushrooms. (I had read some reviews that noted "skimpy" on the cheese, so I was covering my bases here). Both pies were really nice - a good char that we come to expect from the New Haven style, but somehow lacking the depth and flavor that any of the big three in New Haven bring (Pepe's, Sally's or Modern - or for that matter Zuppardis or another handful of great pizzerias in that part of the state). The tomato sauce was fresh - appeared to be just crushed tomatoes, applied on top of the cheese, which was interesting. There was also some swaths of seasoning/olive oil that in those particular bites had a really great flavor, unfortunately not extending to large parts of the pizza. The crust was thin, and light and airy, with great air pockets - lacked a little bit of the extra "chew" that I enjoy, and you had to use a fork or the "fold" technique in order to lift it to eat. If this was the only pizza available to me, I would be a very happy person. In my opinion, compared to the New Haven giants, it places a distant 4th, 5th, or even 6th. It's also a very expensive pizza - they were $21 and $22 each for medium pizzas. I get an excellent large pepperoni pie near my house for $14.50. It's so close to New Haven that given the choice, I'd go to any of the others I listed above before I go back to Grimaldi's. It was also interesting that Tim found a piece of coal on his pie - about the size of a quarter. We were advised after much apologies that the coal "sparks" and sometimes this happens. He's lucky he didn't bite down on it. The waitress kindly advised that she would have offered a free pizza if he had actually bitten it. (staff training it appears is needed). They did offer to remake the pizza, but since we just picked the piece of coal off the pie we declined. If you are in the area, I'd frankly drive a few more miles and enjoy one of the more traditional New Haven pizza joints, but this is a really acceptable pizza overall. Looks very tasty, has the char on the crust that is so essential to New Haven apizza, but its hard to try and fill the shoes of the Big 3...will wait to try this place. I hope you are going to check out Roseland in Derby, that's my hometown joint! Looking forward to your "research"! The pies look fabulous. Too bad the salad was lackluster. Have you tried Camille's In tolland? Dang if that aint the best Pizza I've had in a while. Especially in this area of CT.
several sides were very good. wings from a pizza place. The pizza was Very good..to me (and my lady). If you get the margherita (which I recommend) I would ask for extra Cheese. *Note- It doesn't make it over the top chees-y, but I think it makes it just right. The 1st night we went, we saw a couple taking delivery of one of these babies, and they suggested that we ask for the extra cheese. and we did. (maybe it is fine with the normal amount, but we didn't take the chance, and went with their suggestion) Thin, bubbly dough, wood fired..if that's you're thing, then ..well what are ya waitin for? Sorry I didn't provide pics. @KevinCT - Roseland is an old favorite and we haven't been in years, definitely time to put it back on the list! thefoodguy - we have been to Camille's - there was an article published in the Hartford Courant a while back that noted the "Top 50 pizza places in central CT" - that was on the list. I really enjoyed it, and you are right - we loved our salads, and the sides looked great. Definitely one on the list to hit again. ann peeples - it's a tough job, but someone has to do it! FriedClamFanatic - 12/16/18 inches for personal, medium, and large. Still - a really expensive pizza compared to others in the area. Both pies were really nice - a good char that we come to expect from the New Haven style, but somehow lacking the depth and flavor that any of the big three in New Haven bring (Pepe's, Sally's or Modern - or for that matter Zuppardis or another handful of great pizzerias in that part of the state). In my opinion, compared to the New Haven giants, it places a distant 4th, 5th, or even 6th. It's also a very expensive pizza - they were $21 and $22 each for medium pizzas. I get an excellent large pepperoni pie near my house for $14.50. It's so close to New Haven that given the choice, I'd go to any of the others I listed above before I go back to Grimaldi's. That's the only problem with the New Haven-area greats - once you try them, everywhere else has such a high standard to compare to. The plain truth is that, while I've had some very good pizza in and around Hartford, none of it, so far, has compared to what I had from Sally's, Pepe's, Modern, or Zuppardi's. Granted, driving all the way down there isn't always viable, but I can never shake the feeling that I'm "settling" when I go anywhere else (unless I'm after something specific, like the huge NY-style slices at Angelina's in West Hartford). BAR is the last well-known New Haven place that I have to try! For a change of pace, we also ordered the mashed potato pizza. This is solid, really tasty pizza, we are fortunate to have such a great place so close by! Highly recommended. Little City is hard to beat! Yum! Can't wait to eat there week after next. How about Pepe's in Manchester and Hartford? Never been to the new Hartford location, but, the Manchester location has been good except for service issues. For a while it was very poorly managed, always out of clams. Fair point. The Manchester Pepe's was actually the first pizza I had when I moved here. "Plain" with tomato sauce, olive oil, garlic, and grated cheese - no mozzarella. Toppings were sausage and extra garlic. It was excellent, and it showed me for the first time that a layer of cheese isn't necessary for a good pizza if everything else is up to snuff. The bacon and onion was fantastic. Guess I'll need to revisit both locations and compare exactly the same pies. @Ketteract - you are right, the New Haven greats set the bar for us so it is hard not to compare, unless it's a completely different style of pizza. @joerogo - we used to go to the Manchester Pepe's often, but they really started to have a lot of inconsistency in the pizza - too thick and undercooked, burnt to a crisp (completely black pepperoni coins on half the pizza - way past char). There didn't seem to be anyone caring about the overall quality. We went back in the last few weeks, and it was.....ok. I just don't see the same commitment to the product that you will see in the New Haven original restaurant. I haven't tried the West Hartford location so can't comment. TnTinCT, The pizzas I had in Manchester were good, but I did walk out twice because they were out of clams. The staff, IMO were always rude, everybody was behind the counter stuffing their faces and then handling food. Very poorly managed. Now I stop in Danbury, never had a bad experience there. I recently had Grimaldi's in Las Vegas, I would say the taste was very close to Brooklyn(had the pleasure of dining with BillyBoy there). I didn't think I'd have anything to say in this thread, but it opens with Grimaldi's! When we moved to Dallas in 2005 we searched far and wide for even a decent pizza. It was truly a 'pizza desert'. Then a few Neapolitan-style places opened (Coal Vines, Olivella's) and hit the proverbial 'home runs' in local reviews. Seeing the opening, Grimaldi's opened a few Metroplex stores and the race for pizza perfection was really on. Today, there's 'worthy' pizza pretty much everywhere. Today, we go to our local Grimaldi's four or so times a year and it never disappoints. And yes, they certainly know how to charge - we typically pay $50 (including tip) for a large pizza, a single salad, iced tea, and a shared dessert. If it were less expensive we'd probably go more, but the place is always packed. TnTinCT, that mashed potato pizza looks like my new best friend! Joe Rogo, that was a good lunch at Grimaldi's. They key with that place (and with DiFara's) is to get there right when they open. I've been back to Grimaldi's many time and still love it. They have moved into a new, bigger location a storefront or two away from the original but the pies are just as good. My favorite thing to do is to get a pie in the summer, take it and a big blanket into Brooklyn Bridge Park and just sit there and watch the boat go by. Gorgeous views! @billyboy - I wouldn't want the mashed potato all the time, but it's really tasty when you are in the mood for something a little different. 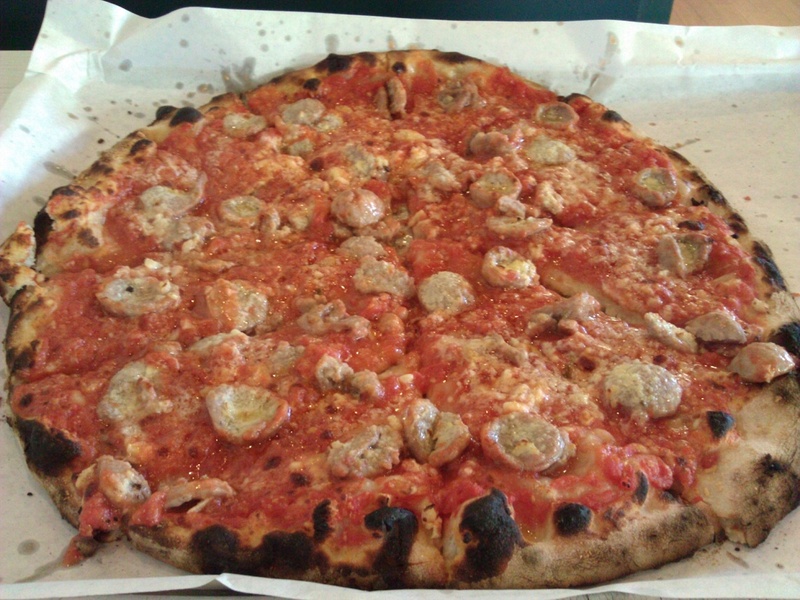 We went back to an old favorite today - Naples Pizza in Farmington, CT. It's a tiny place - 4 booths and maybe 6 tables, so if you plan on eating in you have to time it right or be willing to wait. We went in between lunch and dinner, caught some March madness on the TV near the entry, and had some delicious pizza. Naples' pizza is a blend of thin, thin New Haven crust, but with a bit more sauce like a New York pizza, and cooked in a similar way (e.g. not so much char). I always think of my sister who lives near Huntsville, Alabama, and how happy she would be to have pretty much any of these pizzas available on a regular basis. My standby, pepperoni, made an appearance today - the pepperoni is sliced thinly so it curls up on the edges, and it's mildly spicy. Tim ordered a white clam pie. While he enjoyed it, it suffered from too much garlic, and in his opinion "it's no Pepe's, that's for sure". Naples has a broader menu, some good salads, sandwiches, and pastas (although I can't personally vouch for anything other than pizza and salad). They also do slices at the takeout counter if you're not in the mood for an entire pizza. (these were small pies that we ordered). Another winner - we are lucky folks to live here among all this great pizza! That looks great! You can tell when a place uses good pepperoni by the curled edges! 1) The edges of the 'pep' are turned up. 2) The thin crust 'supports the load' right to the tip of the slice. Assuming the cheese and sauce are as 'right' as the rest, this is pepperoni pizza perfection! Now I want an apizza from Pepe's. You folks in CT get all the good stuff! Not fair! Maybe you can work out a trade with someone. They send you a pizza from Pepe's, you send them one from Donato's! If we sent a Donato's pizza to Connecticut we would be banned from the Nutmeg State for life. @annpeeples - love me the crispy edges on the pepperoni! @lleechef - I am so sorry to torture you. We are very spoiled here in CT with all our great pizza. @screaming chicken & michaelhoffman....not familiar with Donato's - I know there is some strange regional pizza out there - how about a pic and some details? I know Donato's only by reputation...and from what I've read here and heard from Ohioans it's a pretty mundane chain pizza. Oddly enough, in all my years of traveling there I've never tried it! The only Ohio chain I'm personally familiar with is the Mio's located in Lebanon. I would do the fold technique!!! When I was in Alaska MH ordered a Donato's pizza. He said it was so bad that he threw the other half away. I was blissfully eating Alaskan seafood. 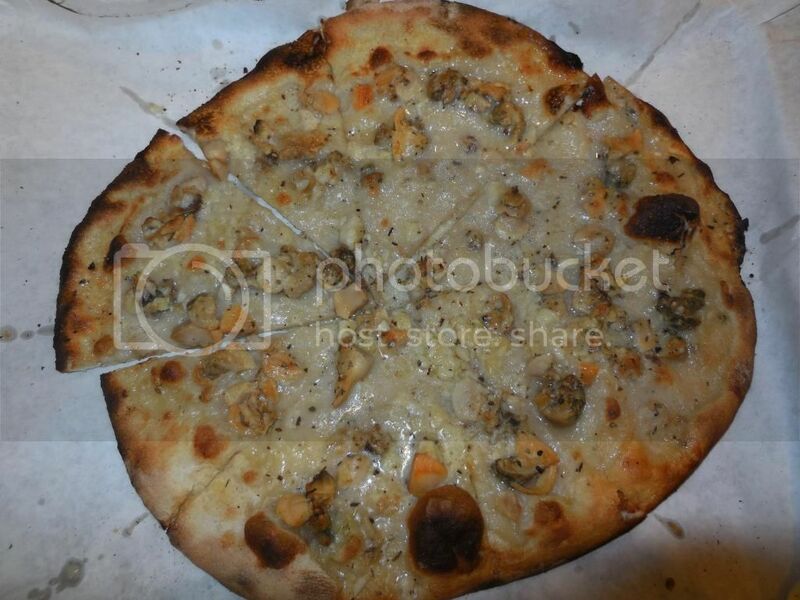 But the clam pie that I had at Pepe's still haunts me. See that thin little piece at 11 o'clock on her apizza? Well, I was allowed to take one tiny bite of the pointy end. That's all. Love that story!! You need to order your own pizza to be sure you get some. I TOTALLY understand refusing to share such good pizza. And I have to say I'm on lleechef's side - I need the cheese. There was cheese. Grated Pecorino Romano cheese. Lucky us! A friend was in for work this week and nothing would do but to make a trip to New Haven to Modern Apizza. Tim and I both prefer Modern to Pepe's or Sally's (with the exception of the Pepe clam pie). The comparison, truth be told, is really more of rating out of 10 - a 9.99, 9.98, 9.97. Modern is a bit saltier, I prefer the cheese coverage at Modern (they use shredded vs. sliced), and we love their simple italian salad with a giant handful of their salty mozzerella on top. The crust in the middle of the pie can sometimes bit a bit limp, especially if you get a lot of toppings on your pizza. 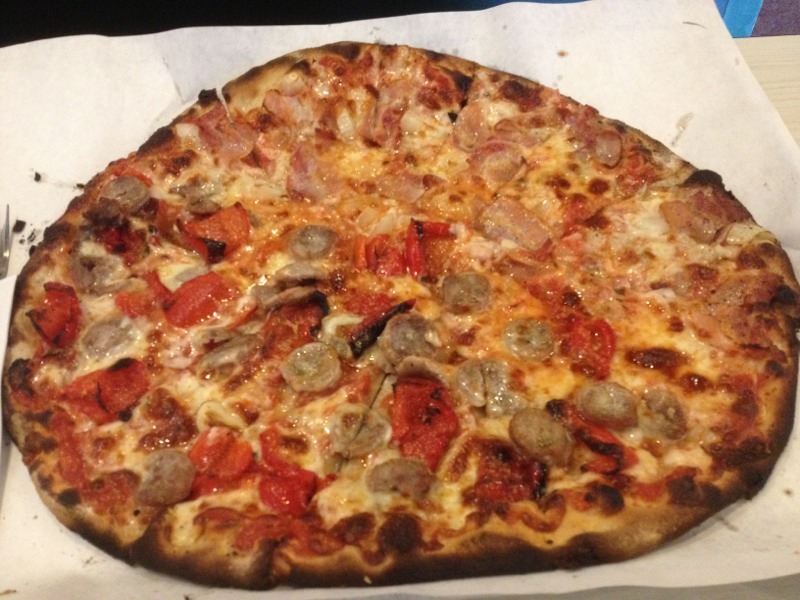 We stick with our usual simplicity - a pepperoni pizza, and a sausage/onion pizza. If I have to throw in a vote, Modern is my very favorite pizza of any pizza ever. (and that's saying a lot - we eat a lot of pizza). Here are some pictures for your viewing pleasure. The char is beautiful, the dough very very thin, with a lovely chew, dry/aged shredded mozz. It's pretty much a perfect pie. How lucky are we to live in Connecticut with all this great pizza? Nice-looking pies! Out of the New Haven places, Modern does the best char, in my opinion. It's more balanced than Pepe's, and it's also a good introductory pizza for someone unfamiliar with the style. I recently had a friend visiting from Iowa, and he was blown away - "I didn't know burned crust could taste so good," he said, or something to that effect. The sausage in your photos looks okay, though not in the same league as Zuppardi's. I think all the New Haven-area establishments are good at different things, so picking a favorite depends on what you're looking for the most in a pizza. If I want good sausage, I go to Zuppardi's; if I want bacon and onion, I go to Pepe's; if I want the best char without having to ask them to bake it differently, I go to Modern. 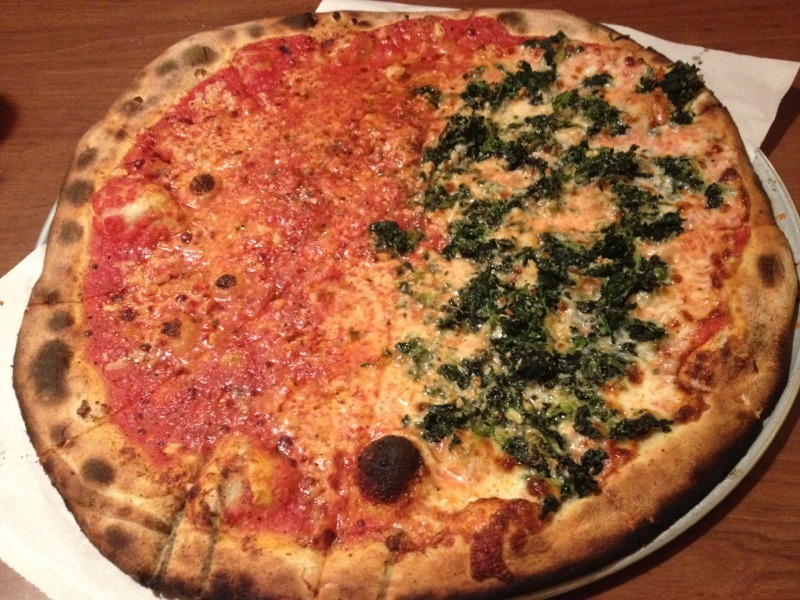 Here's the pizza we had at Modern: half plain with garlic, half spinach, mozzarella, and garlic. We actually preferred the plain half - the sauce was just that good!